In 1929, a Georgian known as Mr. J. T. Thrasher introduced a unique concept into the business community of Ocean City, Maryland. This creative Southerner proposed a food stand concession, which would specialize in only one product: the noble French fry. Meeting with skepticism, Mr. Thrasher, an extremely religious man, forged ahead with his fledgling enterprise. His idea? Simply to produce the best tasting French fry ever eaten – past, present or future. He did. 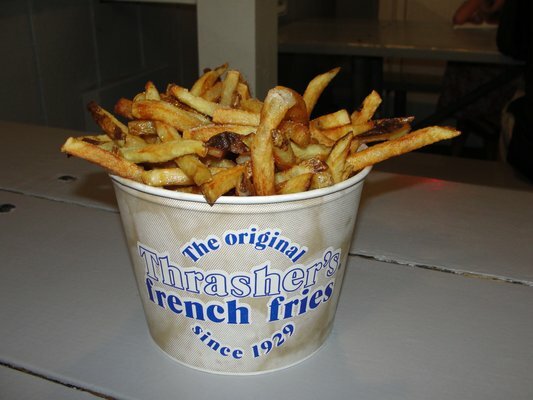 Â The process Thrasher originated was based upon quality ingredients, hard work, and above all attention to the perfection of each cup of fries. What a discovery! Of the product itself, Thrasher found that only the highest quality potato would suffice. This meant that potatoes had to be bought from different regions, if not states, for different times of the season. Only the best would do for this hard-hosed professional. For labor, Mr. Thrasher relied upon a group of hard working girls from a Christian affiliated school in Georgia. These dedicated young women ran the operation for many years. Boss Thrasher would house the girls in a dormitory above the present Bank of Ocean City. Tradition, rules and quality still reign supreme. There has been no deviation from the original procedures or original recipes. Only experience and attention to detail have allowed Thrasher’s to grow and flourish as few businesses have. Those who have tasted this delicacy believe that nowhere can a better fry be found! There are now three locations in Ocean City Maryland and three in Rehoboth Beach Delaware. If you find yourself in the neighborhood, go find out for yourself what all the fuss is about. You will not be disappointed. I live in Berlin Maryland. I was married 45 years ago. I am from Alabama. My mother was a Thrasher. I just went to Marrietta Georgia and found my great grandparents. Mamie and Thomas thrasher. I am curious to see if he had related to the man who founded thrashers in o.c. Who is the person who is now sending out Thrasher newsletters? I have been very ill for the past 4 years. I would really love to get some of the back issues and also pay for the coming year. Thanks!